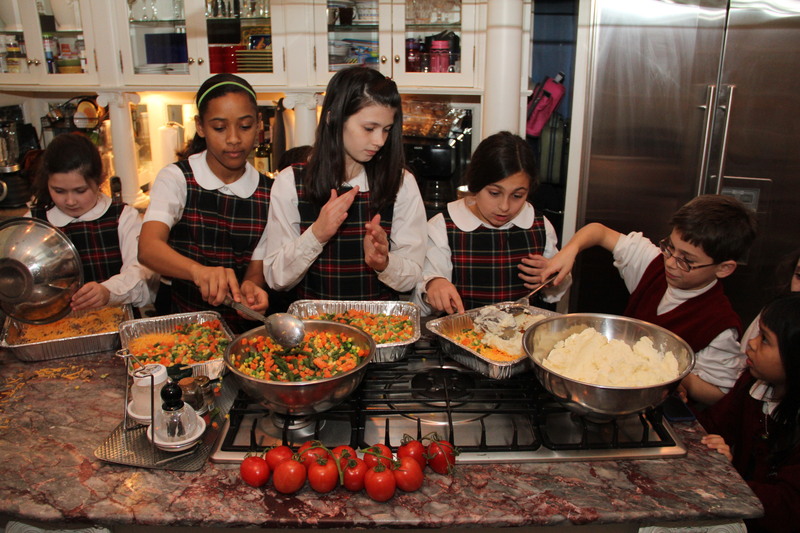 From left, Audrey DeLucca, Jaia Culmer, Sophia DeLucca, Adela Holahan and George Binck, students of St. Mary Interparochial School in Philadelphia’s Olde City section, prepare casseroles for the homeless women and children of Mercy Hospice in the city. Kick boxing, piano lessons, St. Mary Interparochial School, food preparation and Mercy Hospice. What on earth could they have in common? It’s complicated. About 10 kids attending the lower grades at St. Mary, located in Olde City, Philadelphia, meet at the home of the Holahan family every Friday after school for piano lessons, which are given by a teacher from the nearby Curtis Institute of Music. In addition to the Holahan children, there are children from the Autieri, Binck and DeLucca families. While the music lessons are going on, the mothers do the basic cooking for casseroles that will be finished by the children and donated to Mercy Hospice, one of the programs of Catholic Social Services supported by the Catholic Charities Appeal. Mercy Hospice provides shelter and comprehensive programs for 21 homeless women and their children. The whole thing was an idea of Angie Holahan, who wanted to find a community service outreach project for her children and their friends. She asked another mother, Christine Jaeger, who is a staff member at Mercy, if there was a need they could fulfill. Jaeger explained that the hospice doesn’t need clothing or toys but there is an ongoing need for food and the families really like casseroles. The casseroles prepared on Fridays are delivered to Mercy by mothers and their children the following Monday. “The children get their piano lesson, have an opportunity to bond and have a community service as a way of giving back,” said Toni Autieri, the mother of two of the children. Joseph Holahan who is in grade two, seconds that. “I enjoy this,” he said. Even more enjoyable for him are the piano lessons. His favorite composer? Joseph thought for a minute. “Mozart,” he said. On one particular day the casseroles are Shepherd’s Pie. Other weeks it might be lasagna, or a chicken and rice dish, or even a meat loaf-based dinner. The casserole project just began this school year, but if the children have their way, it will go on for a long, long time.